1) Deducting: Correct TDS while making payment as required by law. 2) Depositing: The tax deducted on the same day in case of book transfer & by 7th of the following month if using challan. 4) Issuing: The TDS certificate in Form 16A on Income other than salary for the quarter ended 31stDecember 2013 by 15th February 2014.
v All deduction must register themselves at http://www.tdscpc.gov.in(TRACES Portal). v All deduction must choose correct and relevant form for filing of quarterly TDS statement, quote correct PAN against all entries in the TDS statement and ensure that correct TAN, TAN category & CIN/BIN is quoted in the TDS statement. v Delay in filing of TDS statement shall entail levy of fee of Rs.200 for each day of default not exceeding amount of tax deductible. v Non-quoting of PAN or TAN in TDS statement may lead to levy of penalty. v TDS certificate cannot be downloaded from TRACES Portal in case of non / incorrect quoting of PAN. v TDS certificate in form 16A, containing 7 character TDS certificate number, has to be mandatory downloaded from http://www.tdscpc.gov.in. v File a correction statement in case of any mistake found subsequently in the TDS statement already filed. v AO (PAO/TO/CDDO) must file Form 24G on monthly basis in time to get Book Identification Number (BIN). v Government deductors must collect BIN every month from their AO and quote the same in the quarterly TDS statement. v Form 24Q/26Q cannot be uploaded without quoting BIN. 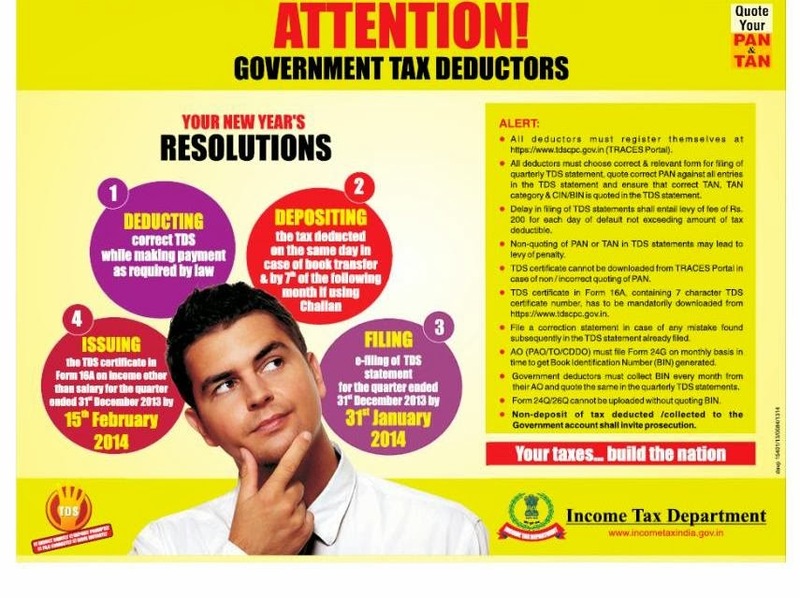 v Non-deposit of TDS deducted / collected to the Government account shall invite prosecution.